Experiencing a wide spectrumked alongside Ansel Adams in the 1960’s. LaRue attended summer classes in photography at Southern Me of creative expression at an early age, Doug embraced the raw organic nature of painting expressed by his mother, an accomplished Oil Painter and the technical aspects of Photography and Design from his father, an Engineer. In elementary school Doug would draw race cars and sell them to his friends for .5¢. He began to win art contests by 8th grade and quickly advanced through honors Art classes in high school. He interned with several photographers before college including Dan Coleman, a Fine Art Photographer who studied and worthodist University. As member of the yearbook staff his team won a national publication design award and was featured in a documentary film which led to a college scholarship. He graduated from Texas A&M University with a Bachelor of Science degree in Environmental Design while working as a Sports Photojournalist. After graduation Doug spent three years as a Medical Illustrator for the Texas Veterinary Medical Center at Texas A&M University where he continued to study art by training with traditional mediums and on highly specialized graphics computers, film and printing equipment. Most notably the Advanced Airbrush Workshops at the Smithsonian Institute of Natural History in Washington, D.C.
LaRue moved to Austin, Texas, to take a position as Art Director for The Littlest Book Company. 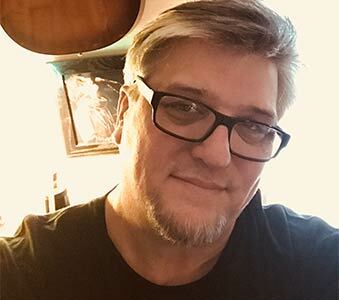 The challenges and friendships that grew from the publishing company allowed Doug to venture into other creative fields like Architecture, Design and Motion Pictures. His work captures conceptual moments by merging the flowing brushwork of an expressive artist combined with the lighting and framing of a seasoned photographer. His award winning digital skills perfectly compliment his traditional talents. La Rue’s style is deeply rooted in the European and Latin artistic traditions, drawing particularly on the work of such greats as Claude Monet, Remedios Varo, Gustav Kilmt and Massimo Scolari. His work has been acquired by significant collections in the United States and Europe.